This workshop focuses on understanding employees’ needs and retaining qualified employees. Specific tools are taught to help attendees succeed at managing employees. 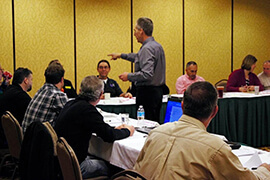 In addition, this automotive management training workshop includes the seven links of the service-profit chain; understanding the importance of using tools such as employee handbooks, job descriptions, and performance reviews; methods of effective delegation; understanding key reasons technicians and service advisors change jobs; methods of employee development; optional benefits and informal rewards, as well as retention factors.